James Bond. Doc Savage. Indiana Jones. MacGyver. All guys who seemed to have unlimited resources and unlimited adventures. All owe something to the pulp action stories of yesteryear — with Doc Savage being one of the icons of that era. Now we have Gabriel Hunt. 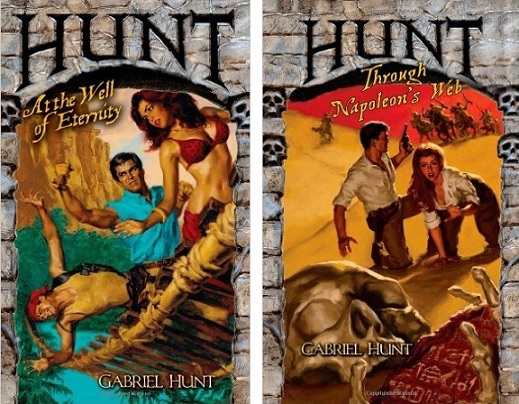 The Gabriel Hunt series is an attempt to bring back the pulp action hero by the folks at Hard Case Crime who have almost single-handedly brought back this genre (now published by Titan Books). With a premise of Hunt being “backed by the resources of the $100 million Hunt Foundation and armed with his trusty Colt revolver,” how can you go wrong? The series is fast-paced escapism as Hunt travels the world in search of lost places, deadly ancient mysterious and Bond-esque villains at every turn. And, of course, Hunt is quite the lady’s man. Unfortunately, the series only went six volumes. Recently re-released (although not with the original pulp-art covers), maybe the Hunt Foundation will return? Perhaps Hunt can save us from too much “heavy handed message fic” — not that we want to check out from the issues of society, but sometimes escapist fiction can teach us a thing or two. Like that we need a few more Hunts, Savages and MacGyvers in the world.